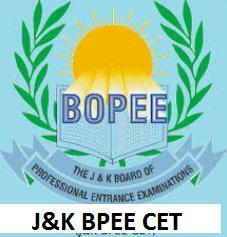 BPEE CET is popularly known as Jammu & Kashmir Board of Professional Entrance Examination Common Entrance Test (J&K BOPEE CET ). This entrance exam is conducted by Jammu & Kashmir Board of Education for the candidates interested for admission in undergraduate Engineering Programs. The entrance test will take place across Jammu & Kashmir in different centers in the month of May. The candidate will be selected on the merit basis obtained in entrance exam followed by the applicant’s admission to the participating colleges. It is a State level Examination. The applicant must have to be permanent resident of J&K State. For SC/ST/OBC the marks to be obtained is 40% in class 12th. The applicants who are appearing or are waiting for the results of 12th class examination from any recognized board are eligible to apply for J&K BPEE CET. The application form will be available online. The candidates need to fill the form online. The application form will be tentatively available from the fourth week of January. The following are the few steps to be followed for the online application form:The application form will be available on the following website i.e. (www.jakbopee.org/www.jakbopee.net), the candidate should visit the mentioned link to apply for the application form online. Next step is to register for the fresh application form. The details need to fill to receive the application number. The candidate will get a login id to login the account using the D.O.B and Application No. Followed by the details to be filled carefully like qualifications, address and photo upload, signature of the candidate and thumb impression. After the payment of the application fee, the candidate should click on the ‘submit ’and the form fill up process will get complete. The candidate can download the e-challan of J&K bank/ HDFC Bank and the amount of 1000/- in any branch of J&K Bank directly in the BOPEE CET Account. The question paper will have multiple choice questions (MCQ) Pattern. The question paper will have 2 sections. Paper 2 will have questions from Mathematics. The total time duration is for 3 hours. The BPEE CET exam paper will be in English language. The total marks consist of 180. The applicants will have 1 mark each for the correct answer and for each wrong answer, 0.25 marks will be deducted. The admit card will be declared in the last week of May.The admit card is very important for the applicants while getting inside the examination center and this should be shown to the invigilators at the time of the test. The candidate should download the admit card from the official website. The admit card will specify time, venue and all exam related information. Kindly note, if the candidate is not submitting the admit card in the examination hall, and then he/she will not be allowed to sit for the examination. The result will be announced in the 3rd week of June. The result will be published on the official website. The applicants can check their result online by entering the registration details. After the written examination result, the counseling will be organized with couple of rounds for the allotment of the seats. The qualified applicants will be called for the counseling will be held in the 3rd week of June tentatively. Date of birth mentioned in the mark sheet from the board of School education. JKBPEE will be held in the cities of Jammu and Kashmir only.